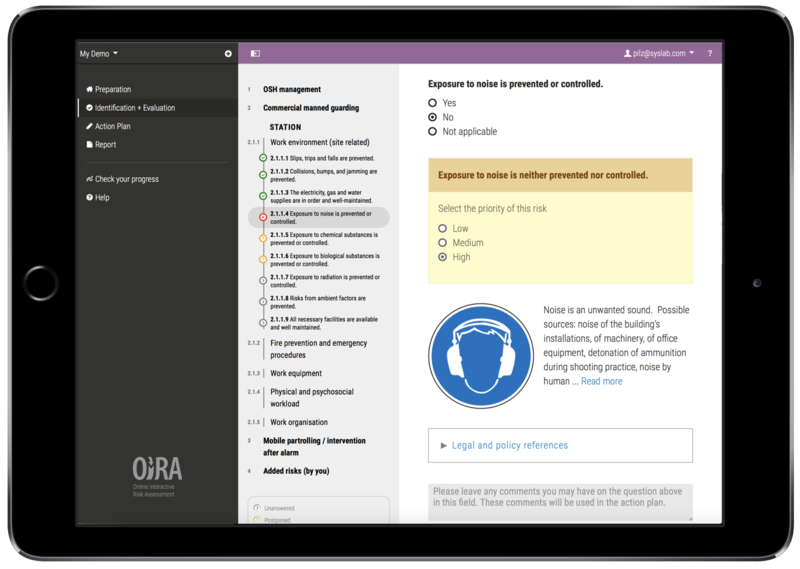 OiRA helps large organisations to easily create and conduct their risk assessments by providing a modern and time saving front end covering all operational and legal needs and is simple and stress free so that your users will love to use it. Outdated, incomplete or unretrievable risk assessments? Unclear word templates? Not knowing which is the right one? More red tape? Will you make the audit? Legal consequences on injury? Are the assessments correct? Are your assessments up to date? Is your staff trained? What happens on accident? 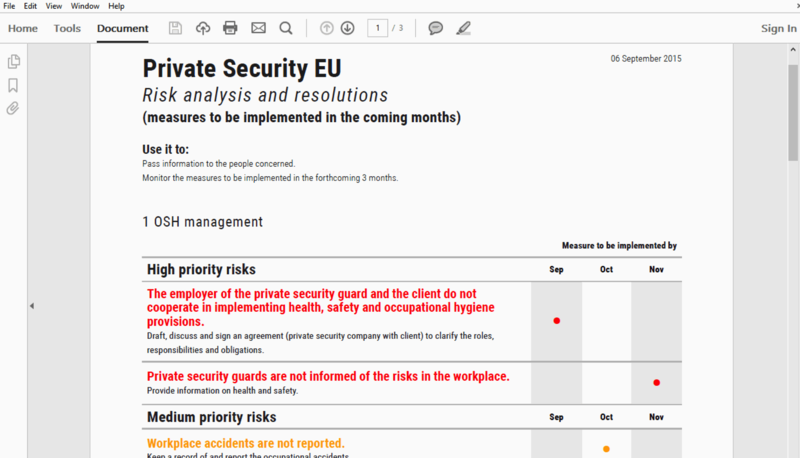 Easy and intuitive creation of risk assessments in the editor. You can create modules, submodules and optional modules to structure risks, provide explanation, law and good practice examples. In simple steps you identify the risks, evaluate them and define measures to remedy the risks. Use your computer, tablet or mobile phone on site. Various reports give you a direct overview here you stand and what you still have to do. Once done, print the final report and submit to the authorities or auditors. Here are some important reasons why OiRA saves time and money. Deposit training content and export training presentation for all risks later. All templated data can be imported as XML and also exported again. As an editor you can save measures from good practice as a suggestion. Design your risk assessment flexibly via modules and policies. Receive automatic notification, if your risk assessment needed review. Export the whole report, only the action plan or statistics. OiRA is already available in 18 languages, more are being added. Revise your templates and preview versions. Large companies can connect OiRA to their Internal ActiveDirectory or LDAP. 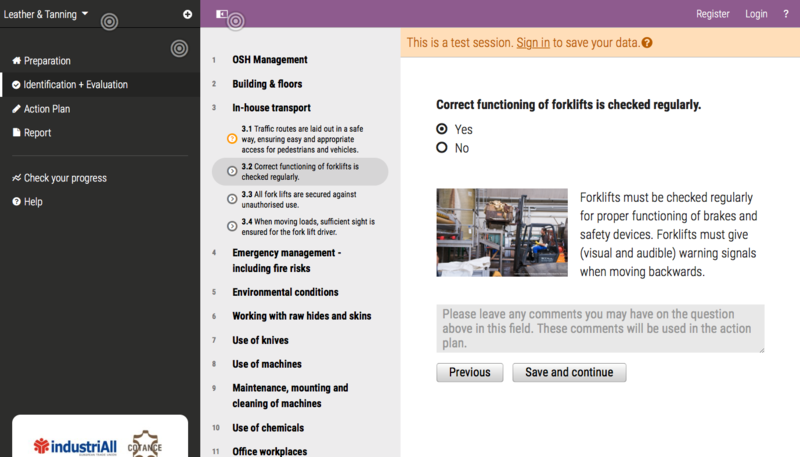 Safety experts create risk assessment templates easily and flexibly online. Local managers conduct the risk assessment for their location online, based on templates and using any device. Once done, they publish the final assessment and optionally create the report. If training is necessary, they download the slides or train staff right within the tool. No technical requirements necessary. Runs in all modern browsers and mobile devices. Enterprisefunction: Connection to user directories and single-sign-on. No need for a desktop: Answer all the questions on-the-spot using a tablet or smartphone. Download the training material for your employees right away. Ease the process by picking measures from a list of good practice examples. Why is Occupational Safety important? How are risk assessments structured? Sign up for a free demo and review a compelling and easy-to-use tool for risk assessment. 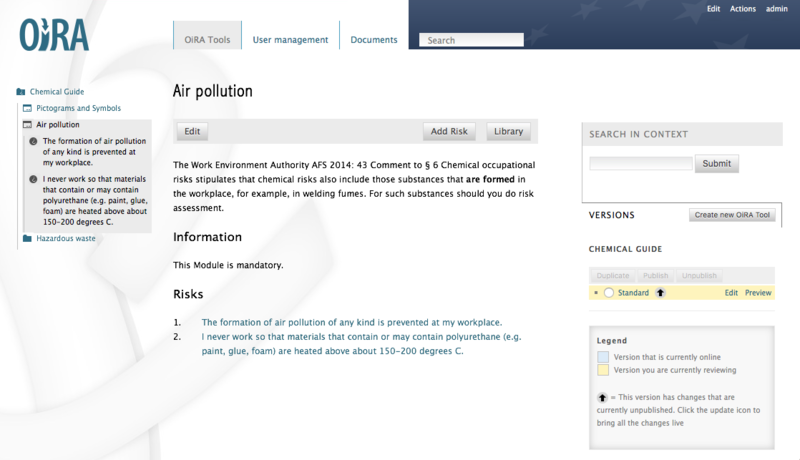 We demonstrate OiRA on our test server and answer all your questions - absolutely without obligation.